With its inviting exterior and roomy interior, the Harmony will serve as a comfortable home for any family. This two-story house plan has a finished floor area of 2,760 square feet and features a three-car garage, 4 bedrooms, 2.5 baths, and a covered porch. The first floor of the house plan has a formal living room and dining room, as well as a great room with provisions for an island kitchen and a family room with its own fireplace. There’s also a bedroom on the first floor that can be converted into a den. The master suite on the second floor has a sitting area, a walk-in closet, and a master bath. 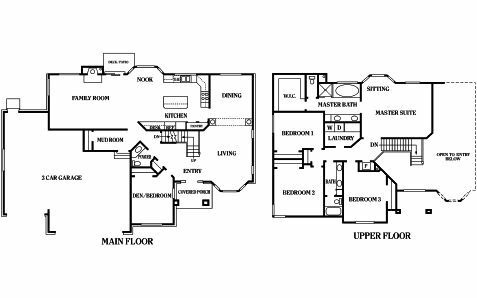 Aside from the master suite, this floor also has 3 other bedrooms, a shared bath, and a laundry area. Perry Homes Utah has been building rambler and two-story homes in family-friendly communities for over 40 years. We take pride in constructing beautiful and durable homes at an affordable price range. Our clients enjoy a seamless home-buying process and the assistance of a design specialist who can help them customize their home. Plus, we also offer financing options and post-construction assistance. Find out more about the Harmony or any of our house plans by getting in touch with us today. You may leave us a message on our Contact Us page or call 801-264-8800. We’ll be more than happy to answer your inquiries and provide you with more information about our construction process and designs.